As always, our mission saw many patients whom we know well, as well as many new ones. In pediatrics, we saw Wilson, a teenager with an unrepaired VSD and Eisenmenger's complex for management of his chronic heart failure. He was doing amazingly well considering the severity of his disease. A new patient was a mother with an 8 month old child who weighed only 5 kg. The mother was tiny, and undoubtedly comes from a malnourished mother herself. The infant had motor skills consistent with a newborn. Mother could not read, so was mixing "Incaparina" (a powdered weaning beverage) with water just until it looked milky, and not adding the sugar it called for. She just fed him this weak solution 4 oz 3 times a day, with no complimentary foods. After careful nutritional teaching, we connected her with her local public health clinic, but we are afraid this child will have limited learning ability himself after experiencing such malnutrition at such an important developmental stage. Other children had diagnoses such as scabies, chronic diarrhea, pneumonia, congenital abnormalities, asthma and epilepsy. Malnutrition and especially stunting was rampant, on some days we didn't see any children at all who hit the "normal" range of the WHO growth charts. We sent many children to our dentists to have permanent teeth extracted due to abscesses or caries that had totally destroyed the tooth. One volunteer was dedicated to just applying fluoride varnish to children's teeth and teaching them how to brush in hopes that future missions will see less of these severe caries. 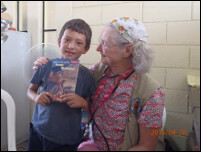 As always, our mission to Guatemala was rewarding, humbling, and ultimately even fun! I plan to go again next year and for as long as I can contribute something to the beautiful people of Guatemala.